This is a small cow painting I just finished today of a Hereford cow that I photographed in Tillamook, OR, near the cheese factory there. 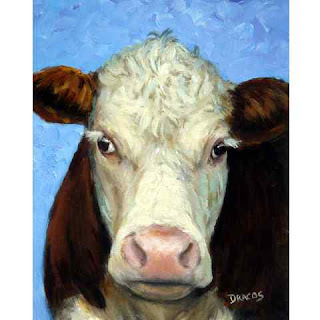 It was a fun, beautiful day, and I photographed a lot of farm animals, many of which I've already painted. This girl was really suspicious of me and my camera but curious enough that I managed to get a few shots of her before she took off to a safe distance. I'm going back to the Coast next week, so I'll be getting some more good images to be painting. 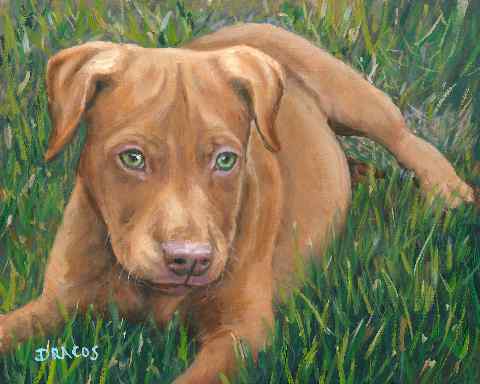 This is a painting of a little pit bull puppy that I just finished yesterday. It looks just like one I used to have, named Edwin. This little guy's name is Charlie, and he's one of the paintings I've done for someone who knows that I don't like to do custom, commissioned paintings but that I will paint your dog for you, but I get to make all the decisions -- and I charge less. Otherwise, it's just like a commissioned painting, but the pressure for me has been lightened, not removed, just lightened. I don't guarantee to paint every photo submitted to me, but I do my very best to do so. The person whose dog this is chose to purchase the painting, but there is no obligation to purchase anything at all from me. I just need good images of dogs to paint, and I don't have the time to go out and find dogs to photograph and paint on my own all the time. So it's a win-win situation for all of us. Hope you like this one. I think pit bulls are such beautiful dogs. Headstrong, yes. Mean, no more than any other dog I've ever had -- which in my case is never, never, never. You've heard it a million times, and it's true: Mean or bad dogs come from mean or bad owners. And the reverse is true, too. 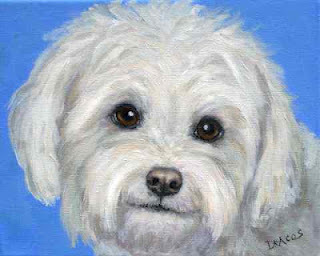 This is a little bichon frise painting I did for a regular customer recently. I said I wasn't going to do any more custom work, but she was a multiple repeat customer, so I couldn't say no. Plus, she was getting for a relative who had recently lost the dog, so that made it even more important that I do it for her. It always makes me so sad to do a painting of a dog that is gone. Even with the still-around portraits I do, I become very emotionally invested in painting the dog's (or other animal's) portrait. When I know the dog is gone, it makes doing the painting much more emotionally difficult. It's such a shame that our best four-legged friends live such short lives compared to ours. 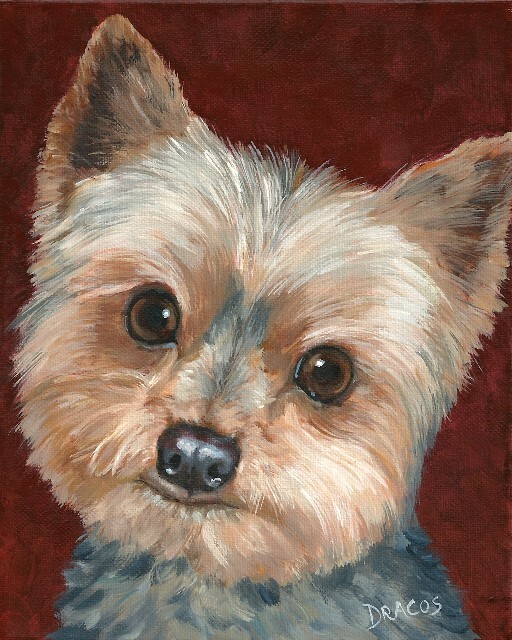 This little yorkie was a small painting I did for a regular customer. I think I'll probably go back in and fluff up the body hair a bit and tie it to the head by color a bit more, too; but otherwise, I really like it. That's one problem I've always had with Yorkies: their face colorations are almost always very different from their bodies, and in paintings, it looks like two different dogs were stuck together. I'll post the change - if it's significant - after I do it. I feel I've been learning so much since I've started my daily painting challenge (and, yes, I realize that I'm behind schedule, but it's my challenge and I'm in charge of it). It's also given me a great sense of discipline, too, much more than I've ever had before. Especially when I'm having a tough time making myself go to the easel, I set a timer for 15 minutes and tell myself that that's all I have to paint this session, just 15 minutes. About an hour or so later, I finally decide to take a break for a while. Works every time. Starting paintings is easy, and I move along very happily confident in my abilities. Then I reach that middle part of the painting, where everything looks pretty darned hopeless (but I know every one of my paintings has to go through this, and they usually come out the other end just fine). This period is when I most need to push myself to keep coming back to the easel, even when I'm afraid. Then finally I get through this stage, and the sailing is pretty smooth through to the end -- unless I decide that it needs just one more little touch-up -- then one more, then one more, etc. That's when I really get into trouble, and that's one thing I've learned with these daily paintings, is when the put the brushes down.